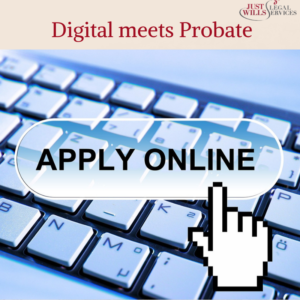 with the launch of a digital service allowing people to apply for a “grant of probate” online. Obtaining a “grant of probate” means you have the legal authority to deal with the deceased’s affairs and distribute any Inheritance to their heirs. It is part of the role of The Executor (s) or administrator to make this application. After registering the death and valuing the deceased’s estate you should be in a position to complete the probate application form. (PA1). Until now you had to download this form from the HM Courts & Tribunals Service (HMCTS) website, complete it and take it to your nearest Probate Registry or Solicitors office. Here you are required to swear an oath called a “statement of truth” that the details you have provided are correct. If you use a solicitor they will charge a small fee for this service. Now the newly launched digital service allows up to four joint executors to apply, swear the necessary statement of truth and pay the £215 fee (for estates in excess of £5,000) online. As with a manual application, you will need the original Will of the deceased, as well as the original death certificate. So in most cases, there should be no need for the applicants to visit a probate registry or solicitor’s office. The launch this month follows a beta trial which started in 2017 in which 93% of users expressed their satisfaction with the service. Currently, the online service cannot be used if the deceased was not a permanent resident in England or Wales or if the applicant does not have the original Will. However, HMCTS say more functionality will be added to the service over time which will include the ability to apply if the deceased didn’t leave a Will. The new service has been developed as part of HMCTS’ £1bn court reform programme announced by Justice Minister Lucy Frazer in November last year. Part of which will be funded by the proposed hike in probate charges which could see relatives paying as much as £6000 to access the estate of their loved ones. Probate hikes aside for a moment though, this online service is a welcome addition to the process, alleviating a lot of stress and effort for the bereaved at such a traumatic time. If you’d like to book a free consultation with one of our legal experts across the UK, book online or call 01342 477 102 and quote ‘Digital meets Probate’.